The Ovation Guitar Company, based in Connecticut and part of the Kaman Music Corporation, manufacture acoustic guitars with a composite synthetic, semi-parabolic bowl shape, instead of the traditional wooden back and sides, which their engineers felt yielded the most efficient and responsive guitar body. Developed in 1965, the first playable guitar was introduced in 1966; they reached the height of their popularity in the 1980’s where they were more often than not seen during live performances by touring artists if acoustic guitars were being played. Other Ovation innovations included composite tops and multiple offset sound holes on guitar tops, pioneered in the Adamas model in 1977.
Notable Ovation guitar players include Cat Stevens, Statler Brothers, John Lennon, Jimmy Page, Shania Twain, Ray Davies, Richard Daniel Roman, Jim Croce, Maury Muehleisen, Joan Armatrading, Glen Campbell, Al Di Meola, Melissa Etheridge, Richie Sambora, Kaki King, Cyndi Lauper, Adrian Legg, Steve Lukather, Yngwie Malmsteen, Ziggy Marley, Stephen Marley, James Hetfield, Josh Homme, Dave Mustaine, Vince Neil, Nikki Sixx, Mick Thomson, Aaron Tippin, Paul Wong, Bob Marley, Robert Fripp, Brian May, Freddie Mercury, Roger Waters, David Gilmour, Luis Alberto Spinetta, Kevin Cronin, Country Joe McDonald, Roman Miroshnichenko, Nancy Wilson, Marcel Dadi, Boz Scaggs and many others. 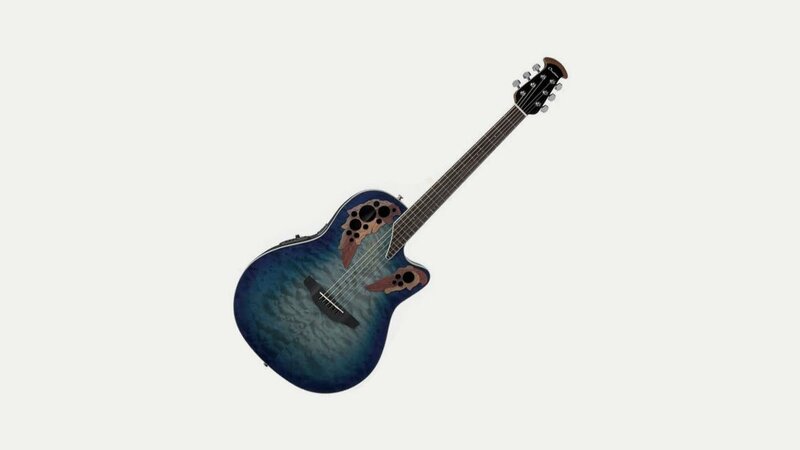 Ovation is the recommended guitar in Robert Fripp’s Guitar Craft.